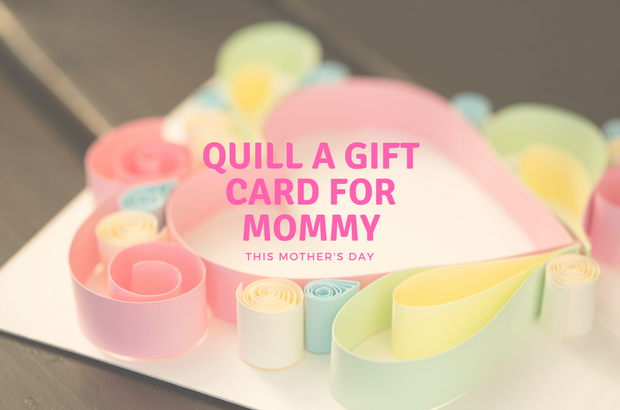 Take gift giving and card decorating to the next level with this quilling tutorial – perfect for Mother's Day. And don't forget grandma! On 13 May families all over South Africa will be celebrating what should honestly be considered one of the most important days of the year: Mother’s Day. And while we certainly can’t get enough of the flowers, chocolates and homemade cards coming our way, our older children might be over the usual fold-over gift card. So dads, why not let them try their hand at quilling? Quilling is the art of looping, rolling and bending strips of paper to make shapes that, when put together in a particular design, creates a 3D artwork. They can really be as creative as they want to and have fun – these can make the most gorgeous gift cards or photo frames to show their appreciation for mom. All your strips of colour cardboard are cut at the exact same width. This will ensure an even display. We cut our strips at 2cm – it’s the perfect height! Be sure to stick your shapes on a sturdier card to hold the weight of your design. Remember – the bigger and more intricate your design, the heavier it will be. Eventually a thinner card will start buckling and bending. Use liquid glue that will dry clear. You’ll be using quite a lot of it and it will show on your card. If you’re looking to kick things up a notch, write a little message in your frame or stick a beautiful image of mom with the family. It’s the perfect way to combine creativity with something precious near and dear to her heart. Give this quilling tutorial a try and send us pictures of your artwork to chatback@parent24.com. Make this Mother's Day amazing!